Starring David Harbour, Milla Jovovich, Ian McShane, Sasha Lane, Daniel Dae Kim, Thomas Haden Church, Penelope Mitchell, Sophie Okonedo, Mark Stanley, Brian Gleeson, Alistair Petrie, Nadya Keranova, Mariya Tepavicharova, Ana Tabakova, Terry Randal, Mario de la Rosa, Laila Morse, Douglas Tait and the voice of Stephen Graham. Distributed by Lionsgate Films. 120 minutes. Rated R.
I thought I had made a fatal mistake. 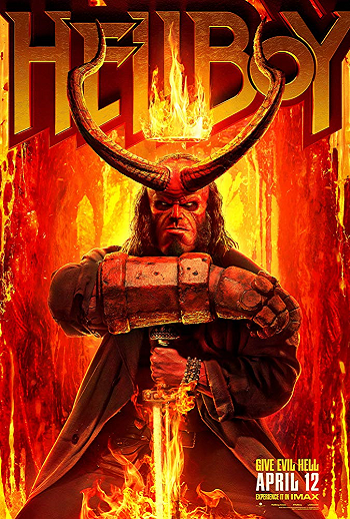 I re-watched the original Hellboy from 2004 (written and directed by Guillermo del Toro), just days before going to see the 2019 reboot (directed by Neil Marshall). I had cut my comic film teeth on the original and it had always represented a mix of noir, humor, and adventure. Based on the original series written by Mike Mignola for Dark Horse Comics, it had a story you could sink your teeth into. Right from the start of 2019’s Hellboy, you knew this was film was going for an entirely different aesthetic. The film opens with a lot of promise – an origin tale for our villainess, Nimue the Blood Queen (portrayed by Mila Jovovich, who is surprisingly well cast in the role). Played out in black in white, save for Nimue’s blood red cape, they tell the story of how King Arthur managed to fight Nimue with the use of Excalibur. He severed her body parts from one another, leading to her banishment to various parts of the world under protection of holy men. All the while she is (headlessly) shouting how her vengeance is eternal. If that sounds gross this may not be the reboot for you, because this gore is barely the tip of the iceberg. From here, the film bounces manically from scene to scene, like reading a really violent comic book with lots of graphics but not a lot of meat to the story. Hats off to the visual effects department and makeup artists. There were eyeballs everywhere and gore for days as vampires, giants, Nimue, and basically most of the other characters try to kill Hellboy, just for being him. (Well, also there is the whole prophecy thing about him bringing on the end of days). The film was a series of big, nasty fight scenes set to loud – but fun – well-timed music. Hellboy wouldn’t be Hellboy without his origin story, complete with Nazis, and his complicated relationship with his adoptive father, Professor Broom (played by Ian McShane), who chose to raise him. This film focuses far more attention on Hellboy’s desire to please his father, his anger with Broom when he finds out the Nazi origin story, and his further anger as he broods about his childhood and being raised as a weapon. Hellboy flows like a film priming for sequels. Many characters are brought into the film, often add little to the story, but bond with Hellboy for setting up what seem to be future adventures. I guess it will be up to the audience to decide if we get to see what more is brought to the big screen. It’s a film that would be well-suited for 4DX… as long as barf bags are provided. Oddly enough, in spite of my love and history with the originals, I didn’t hate what they did with this reboot. Sometimes you want a loud, mindless, gore fest and Hellboy 2019 fits that bill. Copyright ©2019 PopEntertainment.com. All rights reserved. Posted: April 12, 2019. Tags: Alistair Petrie, Ana Tabakova, Andrew Cosby, Bonnie Paul, Brian Gleeson, Daniel Dae Kim, Dark Horse Comics, David Harbour, Douglas Tait, Excalibur, Guillermo del Toro, Hellboy, Ian McShane, King Arthur, Laila Morse, Mario de la Rosa, Mariya Tepavicharova, Mark Stanley, Merlin, Mike Mignola, milla jovovich, movie review, Nadya Keranova, Neil Marshall, Penelope Mitchell, PopEntertainment.com, reboot, Sasha Lane, Sophie Okonedo, Stephen Graham, Terry Randal, Thomas Haden Church. Bookmark the permalink.